This woman continues to inspire me. 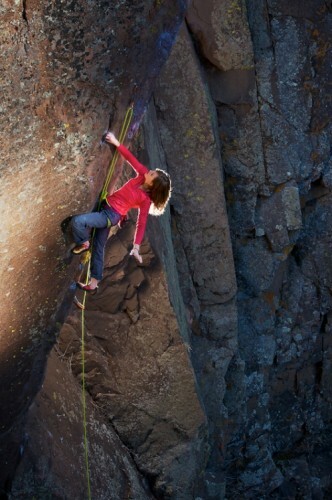 She is one of the few climbers and possibly the only female climber trying this stuff. If you are looking to make faster progress towards your climbing goals it is essential to include strength training into your regime. Whether you view climbing as a sport or activity, there is no doubt that a climber has to supplement their training with weight/strength training if they are looking to perform at a higher level. Look at all other sports and activities. For the most part, the athletes performing at the highest levels are also putting time in the gym to give them the edge. Strength training with weights will allow you feel stronger on routes as well as train the metabolic system required for climbing. So, now that you are convinced that weight/strength training will help you reach your goals for climbing, you need to structure your workouts based on the season and time period you have for reaching your goal. Remember, make attainable goals, and continue to make new goals as you progress. Below is a sample of a strength workout. This is purely just the weight-training component. This does not include other important aspects that need to be incorporated into your training regime such as campus board, systems wall and cardio workouts. Other climbing specific exercises such as front levers, rope climbs, hanging legs raises etc, can also be incorporated into this program. The exercises selected are basic body movements that work the large muscle groups that will no doubt help you climb harder and function better. Here is a sample progressive workout. This can be done 2-3 days a week. Work into it slowly! In addition to this, you can choose to take active rest periods. This is generally done every 4th week of the training program. You can still climb during this period, but try to keep the volume low. All physical adaptations from training occur during the recovery period!! 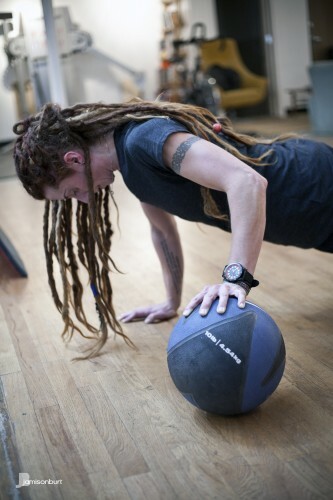 Endurance (3-6wks): 3-6 sets, 10-20 reps (you gotta feel the burn! ), 30s-1min rest in between. Hamstring extensions on the ball. Strength (3-6Wks): 3-5 sets, 4-8 reps, 30s-1min rest. Weight selected should be progressed from 75-90% 1RM. * 1RM means the maximum weight you can lift once. i.e. if you can chest press 100lbs, your 50%1RM would be 50lbs. If you can only do 1 pull up, use a bungee or resistance band to help you do more reps. In order to perform at the optimal level in climbing, your body needs to be well hydrated. Water is the basis of our body, about 45 to 70 percent of total body weight, depending on how much muscle mass you have. When our muscles and joints have the optimal amount of water, they can glide and move easily as we participate in our activities. Water surrounding our muscles also provides the optimal environment for recovery. This is why creatine monohydrate supplementation is so helpful (though I don’t recommend it for most strength-to-body weight ratio sports/activities), because it draws water in and around the muscle tissue. With proper fluid amounts, cellular functions operate at a more efficient pace and allows for wastes and toxins to be flushed out of the cell. 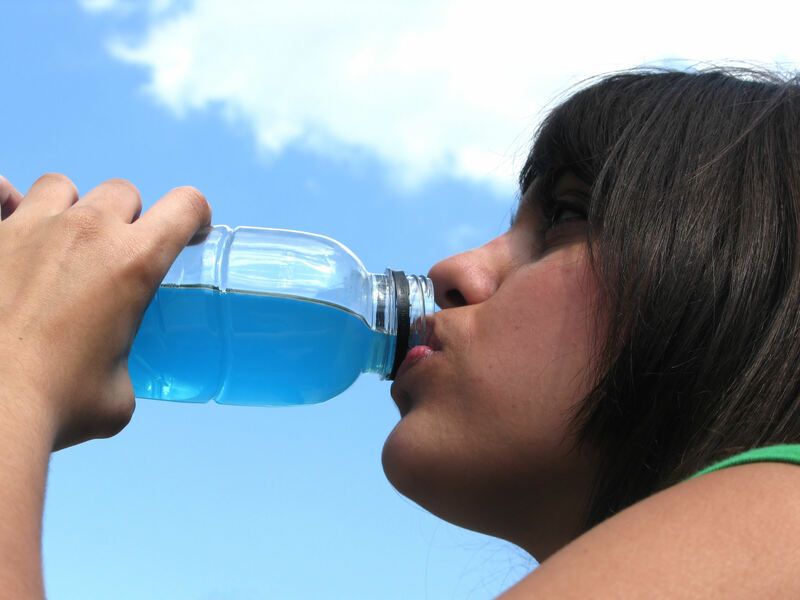 If you are dehydrated, you may notice faster muscle fatigue, reduced coordination and muscular cramping. As a climber, I always found it difficult to stay properly hydrated in the cold and on long approaches. Firstly, no one wants to hike in the extra weight of water, this is why having a purifier is handy, but only if there is a water source near by your crag. Another problem I have encountered with many boulderers and climbers is that drinking water adds body weight, which seems detrimental while trying to crush your problem or route. While this is quite true, it may only add a few ounces at a time as you drink and regularly go to the bathroom. Remember, keeping hydrated while climbing is beneficial for performance on your project and helps with speed of recovery, repairing your muscles and getting them ready for your next training or climbing session. Tips on staying hydrated: try to take a few sips after every burn and eat fruit while you climb. 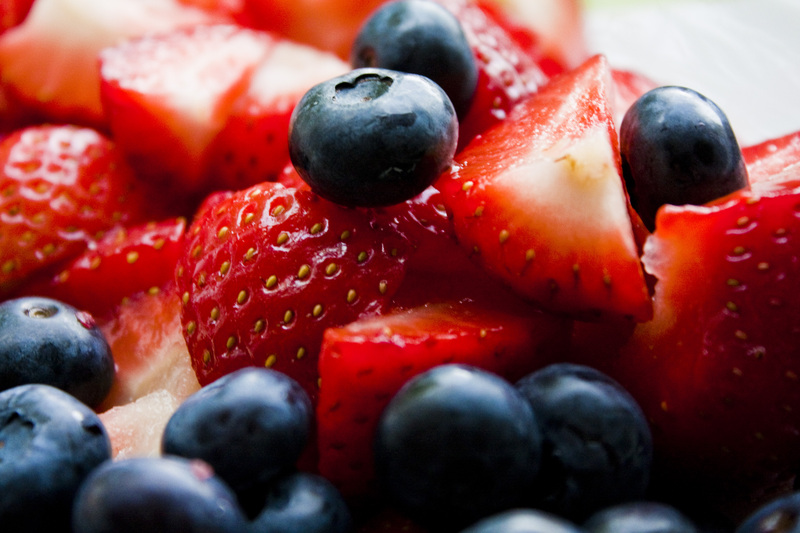 You don’t only get water from drinking it, you also get it from your foods, specifically fruits and vegetables. There’s another reason to eat your veggies daily! Try to avoid fluids with sugar in them, as this can reverse the hydration process, and this also prevents you from drinking your calories, which, when trying to lose weight, can keep you from reaching your goal weight. About 4 hours before activity you should drink 2 to 3 milliliters per pound of body weight to get your body ready and in proper water balance (“Nancy Clark’s Sports Nutrition Guidebook”; Nancy Clark, MS, RD; 2008). Some symptoms of dehydration: headaches similar to what is experienced during a hangover, decreased blood pressure (hypotension), and dizziness or fainting when standing up due to orthostatic hypotension. One’s heart and respiration rates begin to increase to compensate for decreased plasma volume and blood pressure, while body temperature may rise because of decreased sweating (Wikipedia, 2012). Great article about the general reasons for why women should lift weights. Lifting will also benefit your climbing, as it can be used as injury prevention, improve weaknesses and maintain strengths. Are you ready to lift some heavy things!? 8 Reasons Why Women Should Lift Weights | LIVESTRONG.COM. Climbing Magazineis producing a series of How To videos in 2012 to demonstrate a number of skills and techniques. Using our experienced staff and following AMGA guidelines we’ll show you how to get started in the vertical world. In this video Julie Ellison, Climbing Magazine Gear Editor, shows how to tie a figure 8 knot.Thanks to our partners: Wild Country Red Chili, Vertical Girl, and New England Ropes. A top female climber’s personal reflection on motivation and competition in women’s climbing today. It’s Been One Year! WIN stuff for YOUR videos! February marks the one-year anniversary of Girl Beta. In celebration of this event, we would like to give away some sick gear for YOUR accomplishments. Send us a video of you climbing with beta and you could win a Detroit Rock Climbing Company finger board, some Vertical Girl clothing, or some Organic chalk bags and t-shirts. For the next two months, send us your video, and if it is selected, you will be sent some goodies. Video submission deadline April 22nd. Fact: As a female, we definitely have an advantage when it comes to dating in the climbing world. With a ratio of 1 female to every 5 males (totally made that up, but close enough), we have the freedom to be picky about which guy we let “belay” us. The following is my list of reasons why it’s better to date a fellow climber. Some may not agree, and others will vehemently stand against it, but a few may find the list helpful in their search for The One. Read More! 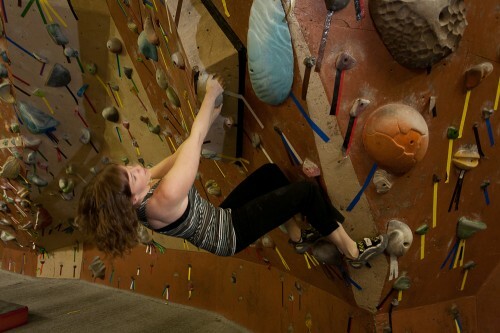 I went indoor rock climbing last weekend. I recognize that, to you, dear visitor of a climbing website, a statement like that isn’t particularly unusual or interesting. It’s not an unusual or interesting statement coming from me either; at least, it wasn’t four months ago. Since August, I’ve climbed once. I canceled my gym membership and my Evolv HERA shoes have been gathering dust since, along with my harness and adorable chalk bag. This coming from a girl who ate, slept and breathed climbing. My hiatus from the sport wasn’t due to an injury or other unpredictable incident, it was a conscious choice. To anyone as obsessed with the sport as I was, it seems unfathomable to stop climbing without a darn good reason, but I had one. When I talk about climbing, I tend to personify the sport. Whether it’s because I’m nuts, or because I take life too seriously, I always refer to the relationship climbing and I have because it’s much more than just a sport. So, as part of that personification, I’m going to liken the break I took from climbing to a break in a relationship. Climbing and I just weren’t working out anymore. The honeymoon phase was amazing. I was in the gym at least three days a week, scouting websites, choosing a bucket list of routes, and working my way into a community of people who were as in love as I was. But, as in any relationship, that phase passed. Issues arose. Internal arguments became more frequent. Finally, I decided the way I was approaching the sport needed to change. I knew I wanted climbing to be a part of my life, I just wasn’t sure in what capacity. So, after four months I drove myself to my home gym for a two hour session as part of an event I led for TerraMar Adventures. My first route felt like a dream. With every step and every reach, I remembered why I used to climb so much. The way I feel when I’m climbing confidently and in control is amazing. My arms and legs felt strong, I was confident, and I had a fantastic belayer who made me feel safe. Unfortunately, as great as it would be to take a climbing hiatus and come back without a fear of falling, I knew it’s wasn’t possible. That fear reared its ugly head on the second route. I was reminded of the sensations I took a break from climbing to avoid. Whatever I was afraid of before was still there. The only way I think I could have made progress on my fear of falling would’ve been to take trapeze lessons, skydive, or do something else that exposed me to that sensation. But even a few bumpy cross-country flights didn’t help. My second route was a long 5.7+, a route I would have done as a warm-up when my hands and forearms were conditioned. I could feel my heart start to race as crazy scenarios ran through my head, I started over-gripping, tired quickly and had to yell “take” three times before I finished it. As strange as it might sound, I have trouble letting people I don’t know belay me, even if they’ve proven their belaying competence. I used to think it was because I didn’t trust easily, and that could be true, but I realized a big part of it is pride. I don’t like to openly show fear. For example, the sensation I in my stomach when I’m falling is something I try to avoid at all costs, which is part of why I’m not a fan of lead climbing. If I’ve got someone new belaying for me, I usually tell them not to lower me too quickly and it embarrasses me every time. I’m essentially telling them, “I’m really scared, please don’t make it worse.” It’s a fear I know I can temper with exposure, but that it’ll never go away. Sometimes I’ve got the energy to fight it, other times I don’t, and telling someone I’m afraid is hard. I felt less of the fear on the third and fourth climbs, but still had to take deep breaths to calm myself mid-route. I can’t imagine leading again for a while, but as soon as I saw all of the new boulder problems I’d missed over those four months, the excitement returned. I found myself sitting underneath a V4 I knew I wouldn’t attempt that day, walking through the moves in my head. Bouldering will always be my favorite climbing discipline, and I’m beginning to believe it’s partially because it doesn’t scare me. Sure, there’s the beauty of the movements, the power, the purity, the social aspects, the fact that you don’t need a partner or a ton of gear, all of these are things I love too. But when I’m closer to the ground, when there’s no safety net (rope) and I’m entirely on my own, I feel stronger. As important as it is to continue to push our limits, mental and physical, a big reason for my break was the fact that climbing was becoming too stressful. The pressure I’d put on myself to lead when I was panicking, to go high because I felt like I should, it got to be too much. Climbing stopped being fun. My first day back in the gym helped me confirm that climbing needs to be a part of my life. I’m not quite sure how yet – how often I’ll do it, whether more inside than out, if I’ll stick mostly to bouldering, if I’ll try attacking my fear of falling head on, etc. But I sure miss the people I used to see all the time, feeling strong and powerful on boulder problems, and taking leaps of faith when I’m ready to fall. Climbing and I, we may not be soul mates, but we’re a great team. I’m looking forward to continuing to explore the best way to rekindle my relationship with the sport, and know I’ll find a way to make it work. Katie Levy is the founder of Adventure-Inspired. From rock climbing to hiking, from mountaineering to mountain biking and everything in between, Adventure-Inspired exists as a place to tell stories and share musings, gear reviews, and anything else related to playing outside.